Ever Wanted to ENJOY VIDEOS, PHOTOS,GAMES AND MOVIES ON THE BIG SCREEN TV OR PROJECTOR In FULL HIGH DEFINITION By Either Connecting Your Smartphone, Ipad or Tablet PC? Now You Can With MiraScreen G2 Wireless Dongle. 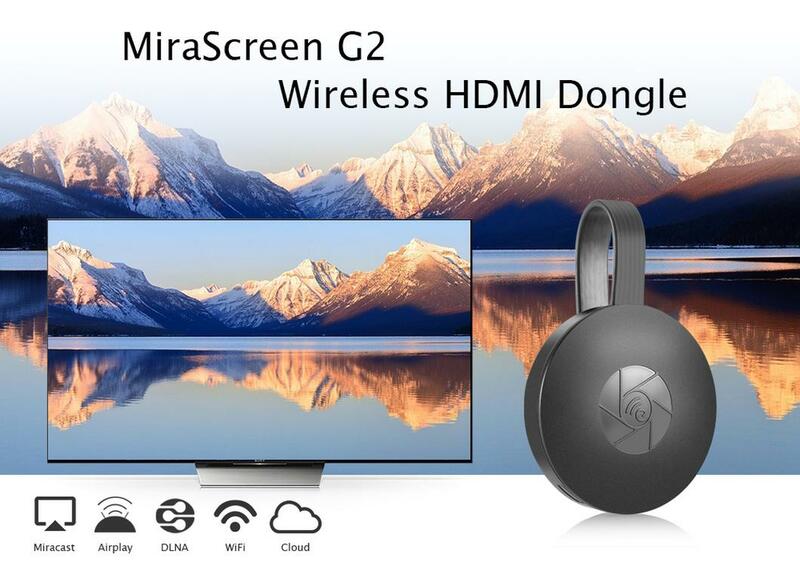 MiraScreen G2 Wireless Dongle is a Special Device to project your Smart Phones / Tablet PC to another big screen devices with HD interface (such as, HDTV, Monitor & Projector, etc) through WiFi connection. And, it supports popular ScreenShare standards, such as, Miracast, DLNA and Airplay, can enhance your HDTV / Projector / Monitor with HD input socket. Moreover, The WiFi Display Receiver has more features such as, streaming video, web surfing, photo viewer, Internet video and more, just to enjoy excellent multi-display sharing. -Strong Compatibility: Compatible with Android 4.2, Mac OS X 10.9, iOS 7.0, Windows 8.1 and so on. -Home Theater & Better Atmosphere: Full HD 1080P output with faster processing speed offers you a perfect home theater experience, sharing the wonderful movies with your whole family on the best display. -Easy Connection:Just plug and play, needs no any other drivers. -Wide Application Perfectly suitable for teaching, business,presentation, meeting, or daily use, such as watching movies, playing games, etc. -Mini Size & Portable: Portable for you to use it anytime and anywhere. -Uses Miracast standard Protocol & as such is not compatible with Netflix, Windows OS & Amazon Video Client. -Is only compatible with Smart phone and Tablet PC, not compatible with PC. -Is not Google Chromecast 2.